Licensed practical nurses, or LPNs, are some of the most fundamental employees in the health care industry and the outlook for this career choice is outstanding. 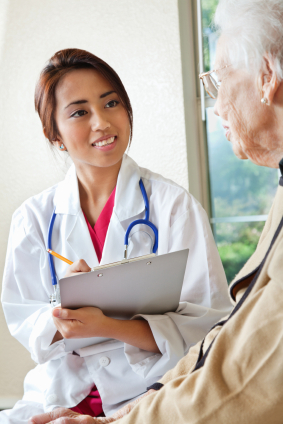 Working under the supervision of a doctor or Registered Nurse (RN), an LPNs job description consists of providing care to the elderly and sick, taking vital signs and performing routine diagnostic work in medical clinics, providing first aid, and helping doctors prep for surgery, among other tasks. An LPN will often act as a doctor's aid, providing immediate care, monitoring medication, and helping to prepare patients for surgery or an examination by a physician. Licensed practical nurses can also find work in other settings, such as private health care in patients' homes, military nursing, and even mobile care in exotic destinations or on cruise ships. LPN jobs are available in every part of the health care sector, and this type of nursing specialist encompasses the majority of health care workers in the United States. Because an LPN has less schooling than an MD or RN, licensed practical nurses aren't allowed to give official instructions to other medical officials (like orderlies or health care technicians). Although an LPN can hook up IVs, a doctor or RN must administer intravenous medications. A typical licensed practical nurse works a 40 to 60 hour work week, often divided into four twelve-hour shifts, with possible overtime. For an LPN working in a hospital or 24-hour medical setting, these shifts can span any hour of the day, including late at night. An LPN's typical workday consists of providing care for patients – whether that means drawing blood, testing vital signs, distributing medication, prepping patients for surgery, changing catheters or wound dressings, helping the sick or elderly with meals and hygiene, or assisting doctors or RNs with paperwork. LPNs should be prepared to work long hours on their feet providing calm, compassionate care to dozens of patients, following doctors' orders without question or hesitation. Although it's a demanding profession, it’s also a potentially rewarding one that can truly make a positive difference in people's lives. The biggest appeal for many people who choose to pursue a career as a Licensed Practical Nurse is the short study period and the ability to quickly enter the workforce. While RNs must study for four years to get licensed, licensed nurse practitioners study in a one- to two-year program and are then qualified to work in a health care center, hospital, retirement home, or other medical setting. Online nursing programs can offer LPN certification for as little as $2,000, and a new LPN can expect to receive an annual salary between $31,500 and $51,500 depending on the type of nursing work and the geographical location. Nursing is a challenging but fulfilling vocation. LPNs live and work on the front lines of health care, interacting directly with patients and acting as a doctor's hands, eyes, and ears.